Your baby’s comfort should always be one of your top priorities as a parent. There are many things that you can do to ensure maximum comfort for your infant and buying the right diapers is one of them. Although most moms tend to have different preferences when it comes to baby diapers, it is vital to understand the different types available so that you can choose the best. One of the dilemmas that most mothers will face when caring for an infant is whether to use regular or overnight diapers at night. But understanding the differences between the two should make your choice easy. It is also important to know the factors to consider when shopping for the best overnight diapers. 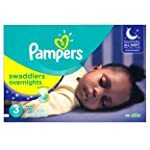 Pampers is a global brand, and it is also one of the most famous diaper manufacturers, and this reputation alone is enough to make any mother trust their brands. The company makes some of the best diapers for babies, and this is why millions of parents across the world trust the brand. Their Baby Dry edition is one of their best-selling products, and this is because it has high absorbency. Unlike most others, it has three layers of absorbency, and so you can always be sure that your child will remain dry for many hours. It also has an adjustable fit, and it flexes to ensure that the child always gets a snug fit. Also, most moms seem to love the delightful Sesame Street characters on each diaper and the impressive number of diapers in each pack. I like the fact that the diaper flexes because it ensures a snug and comfortable fit. Unlike most other brands that have two layers of absorbency, it has three. 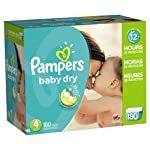 The high number of diapers in every pack makes Pampers Baby Dry very economical. I love the ng Sesame Street characters on each diaper as they look cute on the baby. The design and the materials give it an effective leak protection. These diapers are available in all sizes including Size N.
It is still light even when it is full. The thinner design makes the diaper feel flimsy. They are a little bit stiff. If you are not keen when adjusting it, the diaper will leak. I also don’t like the smell. 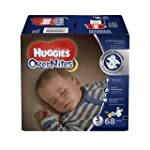 Huggies Overnites are special diapers that will ensure that you never have to interrupt your baby’s sleep at night or the child will not wake up as a result of wetness. 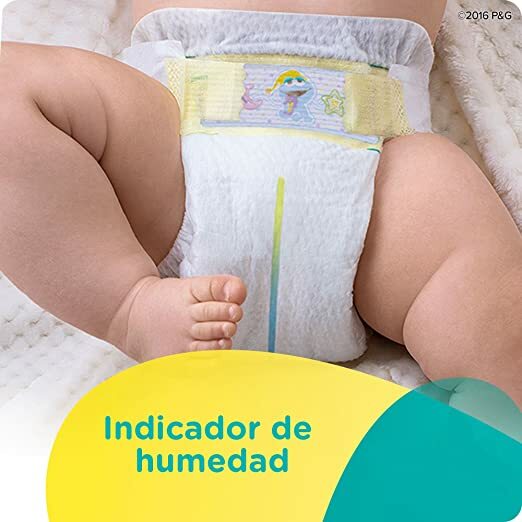 These diapers have a Leak Lock design that keeps the child dry for up to 12 hours, and it also helps to maintain the health of the baby's skin. It also has a leak protection design, and so you will not have to worry about any messes on the sheets and mattress. The Overnites have a SnugFit waistband and some tabs that make sure that you always give the child a secure and comfortable fit. Also, the beautiful Winnie the Pooh graphics help to make these the best nighttime diapers. These diapers are highly absorbent which makes them excellent for use at night. Adjustable fit ensures that you always give the baby a custom and comfortable fit. Huggies makes sure that you get value for your cash by having many diapers in the pack. I love the soft feel of the diaper and how it is gentle on the baby's skin. The graphics that feature a sleeping Winnie the Pooh are very adorable. It has a Leak Lock design to keep the baby dry and protect his skin. This diaper looks comfortable on the baby, and it is also not bulky. It is not an eco-friendly product. This diaper will leak if your child is a heavy wetter. Some sizes are hard to find in local stores. Bambo Nature is one of those baby products that you can use with a clear conscience because it is eco-friendly. But, the service that you get from it is even more important, and the good thing is that it does not disappoint. The materials and design that the manufacturer uses minimize the risk of allergies and diaper rash, and if you combine this with its silky nature you will have something very comfortable and gentle on the infant’s skin. This diaper is also ultra-absorbent, and this makes it ideal for both nighttime and daytime use. Bambo Nature does not have any perfumes but it still smells nice, and it does not contain any harmful chemicals. They have a unique design that minimizes the risk of rashes and allergies. Bambo diapers are eco-friendly, and so you always have a clear conscience when using them. I love their ultra-absorbent nature because it makes them perfect for both nighttime and daytime use. It is a super-soft diaper, and so it is very gentle on the child's skin. 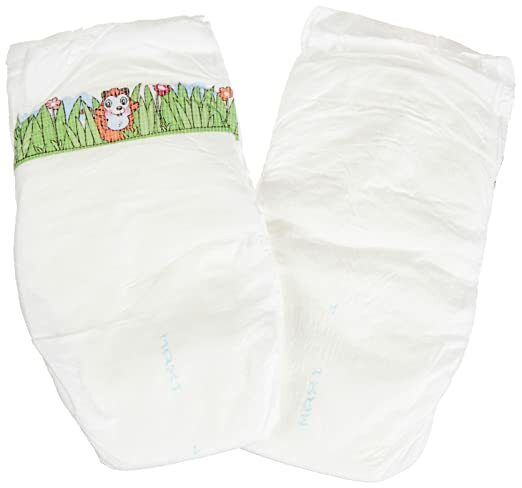 The manufacturer provides an assurance that there are no harmful chemicals on this diaper. It smells nice, and it does not have any artificial scents. It is quite an expensive brand, and the number of diapers in the pack does not offer a lot of value. This diaper is not very effective in containing poop, and so you should expect occasional “blowouts." The graphics are not very attractive. 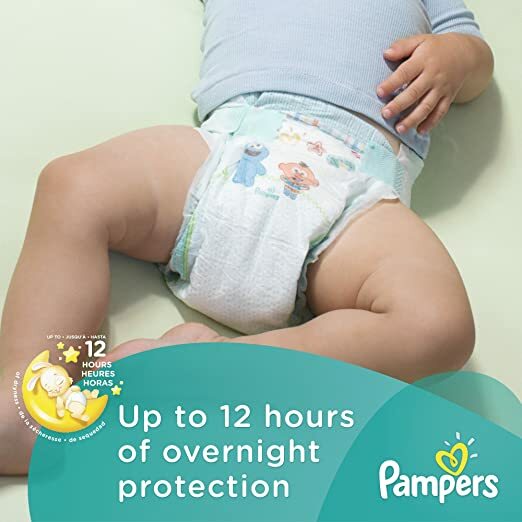 Pampers designs the Swaddlers for nighttime use, and so the company uses materials that guarantee maximum absorption so that the child can sleep without any interruptions. This diaper has what it takes to handle even the heavy wetters, and it is also very soft to give your child maximum comfort as he sleeps. Just like most other diapers from Pampers, they have a wetness indicator and so you will always know when your little one needs some diaper change. 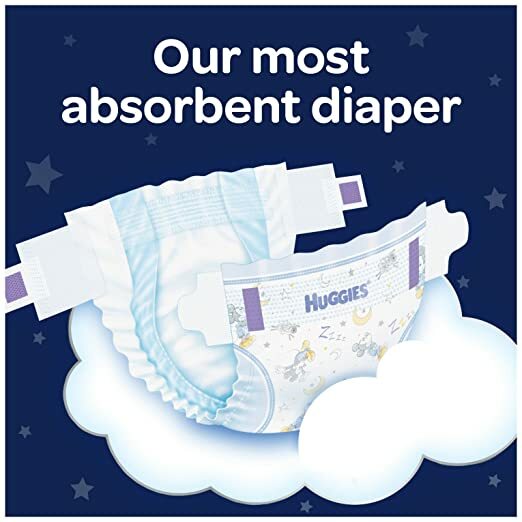 This diaper features a unique Absorb-Away liner that pulls the mess and liquid away from the child’s skin which makes it one of the best overnight diapers. It also has Extra Absorb Channels that distribute wetness evenly to keep the baby comfortable all night long. They are ultra-soft, and the baby will always feel cozy when wearing them. I love the wetness indicator because you will always know when you need to change the baby. The Absorb-Away liner is an excellent addition as it keeps the mess and liquid away from the infant's skin. It has some unique channels for distributing the liquid in an even pattern so as to maximize the comfort. They have an excellent waistband that ensures that you always give your baby a snug, comfortable and custom fit. Pampers Swaddlers are affordable, and the pack comes with a good count of diapers. They are quite thin, and this makes them look cheap. The graphics are too simple, and they are not as attractive as what you get in other brands. It contains some chemical ingredients which are not good for the child and the environment. 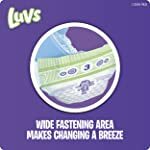 Luvs is always a reliable brand when it comes to baby diapers, and you can always trust them to produce something comfortable for use both during the day and night. The Luvs Ultra features a Leakguard core that will ensure that the child’s skin remains dry so that he can sleep comfortably and for long. It has some large tabs that make fastening easy, and they also help to ensure that you always give the child a comfortable and custom fit. The stretch sides also add to the comfort, and the diaper also has some leak barriers and leg gathers that will help to prevent leaks and diaper messes. Luvs also males the diaper very soft and with a fresh smell which it maintains even when it is wet. The large tabs make fastening very easy. These diapers also have a Leakguard core that ensures the baby’s skin remains dry. I love the leg gathers and leak barriers as they are very useful for preventing leaks. The price and value that you get with these diapers are hard to beat. It is an eco-friendly diaper with no harmful chemicals. 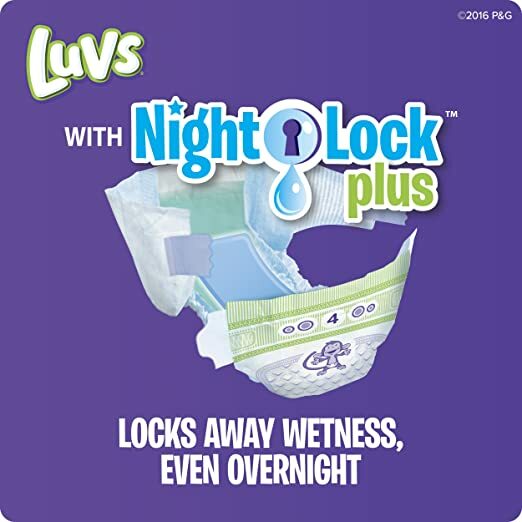 Just like most other diapers from Luvs they are very easy to use. It is a soft diaper with a fresh smell. It is thinner and less absorbent than other Luvs diapers. The waistband and tabs are not the best, and they make it hard to put the diaper on a baby that is moving around. Some of the diapers will leak when they are too full. Most people cannot tell the difference between the overnight and the usual diapers just by looking at them because they look almost the same. But, despite the similarities in appearance, there are still many things that make them different. Knowing some of these discrepancies will help you understand why you need to buy them for your child. As the name suggests the overnight diapers are for use at night when your baby sleeps for several hours, and so they are more absorbent than the regular ones to ensure that the child remains dry. The material of the diapers will also be different because the overnight will have some extra layers to improve absorbency. You will need overnight diapers if you want to make sure that your child does not wake up numerous times at night due to wetness. However, what is even more important is ensuring that you get the best nighttime diapers. But, this can only be possible if you know what to consider when shopping for them. To make sure that you always get something comfortable that will keep your baby dry all night long you should always consider the following important things. As a parent, you will always have to make a choice between cloth and disposable diapers when shopping for the regular diaper. But, you will also need to make the same choice when shopping for something to use on your baby as he sleeps at night. Understanding the merits and demerits of both types will make the diaper choice easy for you. Best cloth diapers are affordable, and so they are ideal when you are shopping on a budget, but you have to wash them after every use. The disposables are very convenient to use, but they are also quite expensive since you cannot reuse them. Also, it is essential to know that if you decide to go for the cloth types, you might need to incur some extra cost for a diaper service. There are many baby product companies in the market, and so each one of them is always coming up with innovations to beat the competition. Those that are in the business of making diapers will try to give their products as many features as possible so as to improve its comfort. It is vital to go through the features before you decide to buy because this is what will determine the suitability of the product for your child. Some of these features include things like wetness indicators, diapers containing some lotion, stretch sides and ultra absorbent core. The more the features that it has, the better it will be for your child, but it is also important to know that those with many extra features tend to be pricey. The diaper material is vital, and so you should always strive to buy those with the best one. Disposable ones come with different layers, and the material of each layer is vital, and so you should make sure that you do not overlook anything. The top sheet is the layer that is in contact with your child’s skin, and so it should be soft, breathable, hypoallergenic and non-toxic. Below the top sheet is the absorbent core whose purpose is to soak as much liquid as possible so as to keep the baby dry as he sleeps. It is important for moms to know that the best overnight diapers for heavy wetters are those with an ultra absorbent core. The other layer in the disposable nighttime diaper is the waterproof outer shell which is what prevents leaks, and you should go for something that is eco-friendly and without any chemicals that can affect your baby. The brand always matters when it comes to baby products, and for most parents, it is the only thing that they will consider when shopping. Although the manufacturer does not always reflect quality, some companies are famous for manufacturing the best overnight diapers, and so you can always trust them to have something that will serve your baby well. And so it is always important to consider the brand when shopping but make sure that you read customer reviews on the particular product before you buy it. Price also matters a lot, and this is more so because you will need to use the diaper every night. Products from reputable companies tend to be pricier than those from others due to the reputation of the company and quality of their products. But, you can always save some cash by looking for coupons and discounts. Size is important when it comes to baby diapers, and so you should always make sure that you get it right. The size charts on the packaging are very helpful, and if you follow them, you can be sure of getting the right one for your infant. It is important to remember that if the diaper is too big, it will leak and if it is also too tight it will be uncomfortable for the infant hence making it hard for him to sleep. Even if you think that the size that you buy is right, you still need to check signs of incorrect fit such as constant leaks, gaps and red marks on the infant's skin. We also have buying guides for the Best Toddler Pillow if you want to take a look. Overnight diapers help to keep your child dry and comfortable as he sleeps and hence ensuring that he gets the vital rest that he needs. With the many types and brands on the market choosing the best nighttime diapers is not always easy. However, the five points above will make the diaper choice easier for you, but sometimes it might be necessary to try a few brands before you find what works best for your child.